I had a call from a prospective housing developer in Mozambique. 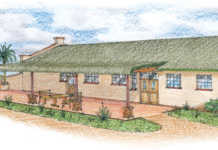 He required plans for easy-to-build, cost-effective and stylish homes for the local community. A cost-effective and stylish home in Mozambique. 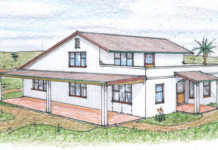 In particular, the houses had to be designed so that the developer could make additions as time and money permitted. I’ve configured all these features in my sketch. There are many variations, but all start with the essentials of a central family room, kitchen and bathroom. The family room, depending on the number of people living in the house, can be used temporarily as a bed sitter. Further bedrooms with non-pitched roofs can be added as required. The developer mentioned that there should be no access to the toilet from inside the house. The toilet room itself is designed to be extended to include a bath at a later stage, while the closet of bedroom 2 can be converted to a passage for a future bedroom addition. 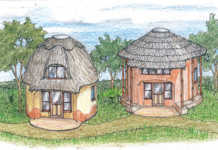 Some years ago, on a visit to Mozambique, I saw several houses in the old city areas with this selfsame styling – mono-pitched roofs and cosmetic features. It had me wondering whether this was a particular style employed by the early Portuguese colonialists, much the same as the Dutch colonialists had the ‘Cape Dutch’ home. 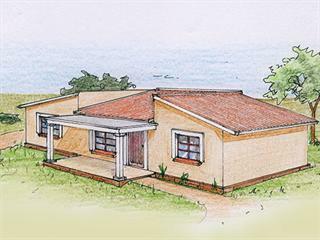 I would appreciate pictures of typical Mozambique homes from any of our readers there. I look forward to other ideas as well.